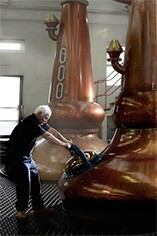 Highland Single Malt Whisky has been produced at the Glengoyne distillery since 1833. The distillery takes its name from 'Glen Guin' or Glen of the Wild Geese, a glen which during the 18th century boasted 18 illicit whisky stills. Glengoyne Distillery lies close to Loch Lomond, at the edge of the Campsie Fells. It is situated beneath the Dumgoyne Hill from which soft spring water flows from a waterfall almost straight into the distillery. Geographically, the distillery lies on the Highland line which divides the Highland and Lowland regions of malt whisky production. As a result of the mild climate and the soft water, the style of the Glengoyne Single Malts tends to be almost Lowland in character. 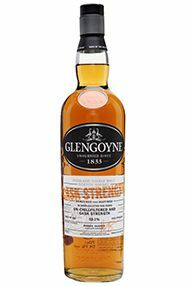 This style is enhanced by the fact that no pungent peat is used at any stage of the Glengoyne distillation process. The result is a pure, engaging single malt whisky in which all the delicate apple and sherry flavours are allowed to express themselves.